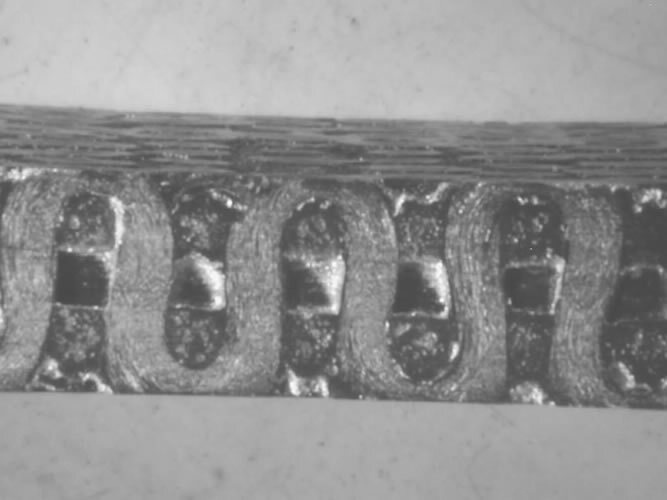 Continuous silicon carbide (SiC) fibre reinforced – silicon carbide matrix composites (SiCf/SiC composites) are an interesting category of structural or functional materials for application at high temperatures in the aerospace and energy fields as they are characterised by high chemical stability and mechanical resistance at high temperatures. These composites are also interesting as structural materials for fusion reactors because of their low neutron activation. The fusion-related R&D on these materials is mainly directed to improving their thermal-mechanical properties, especially their thermal conductivity. Three-dimensional fibre textures (carbon and silicon carbide) with a high fibre percentage through the thickness. [In collaboration with Tecnotessile s.r.l. – Prato, Italy]. 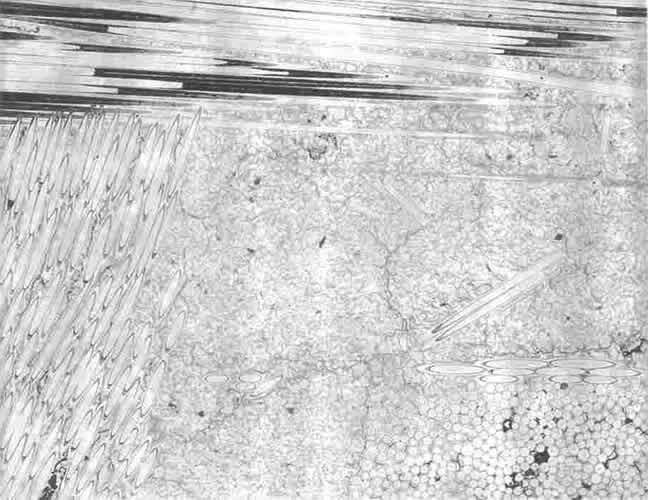 Section of 3-D fibre texture Section of 3-D fibre textureThermal conductivity through the thickness (Z-direction) can be improved by reducing the porosity of the SiCf/SiC composites and by using particular 3-D fibre textures and taking advantage of the conductivity of the fibre itself in the Z-direction.Hence, particular apparatus was used to weave flat silicon carbide preforms with a high fibre density (volumetric percentage 40%) and a relevant percentage of fibres in the Z-direction. 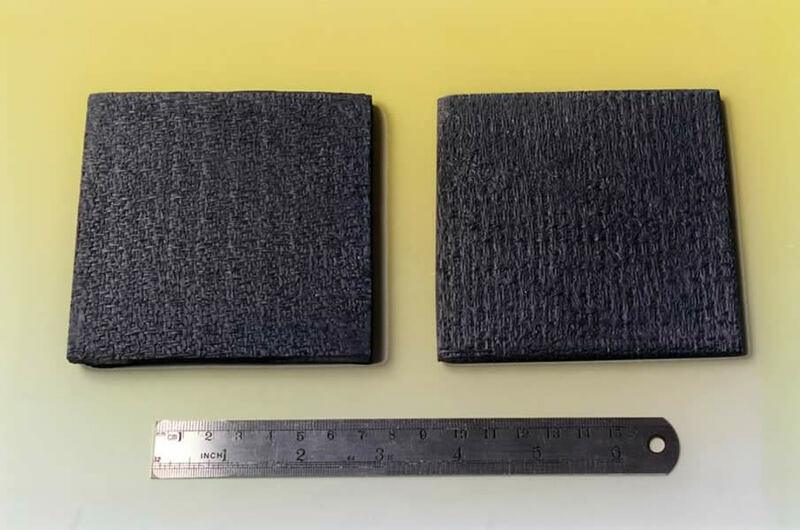 3-D SiCf/SiC composite panelsTwo- or three-dimensional textures are densified with polycrystalline SiC by means of a mixed technology consisting of chemical vapour infiltration (CVI) and polymeric infiltration and pyrolysis (PIP). 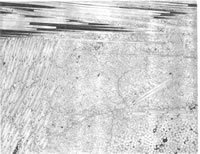 Stoichiometric SiC fibres (Tyranno SA) are woven in flat panels. First, a layer of 0.1-µm-thick pyrolytic carbon is deposited as the fibre-matrix interface; then a layer of 2-µm-thick SiC is deposited by CVI. The final densification is done with a powder slurry and an allyhydropolycarbosylane (AHPCS – Starfire) polymer infiltration process, followed by pyrolysis up to 1600°C. The final material is very pure (stoichiometric SiC matrix), has good density (up to 2.60 g/cm3), high thermal conductivity (more than 30 W/mK) and bending strength up to 360 MPa. C.A.Nannetti, B.Riccardi, A.Ortona, A.La Barbera, G.Vekinis, E.Scafè. Development of 2D and 3D Hi Nicalon fibres/SiC matrix composites manufactured by a combined CVI-PIP route. Journal of Nuclear Materials. 307-311(2003). C. A. Nannetti, A. Ortona, D. de Pinto, B.Riccardi . SiC Fiber Reinforced SiC Matrix Composites Manufacturing by an Improved CVI / Slurry Filtration / PIP Hybrid Process. Submitted to Journal of the American Ceramic Society.